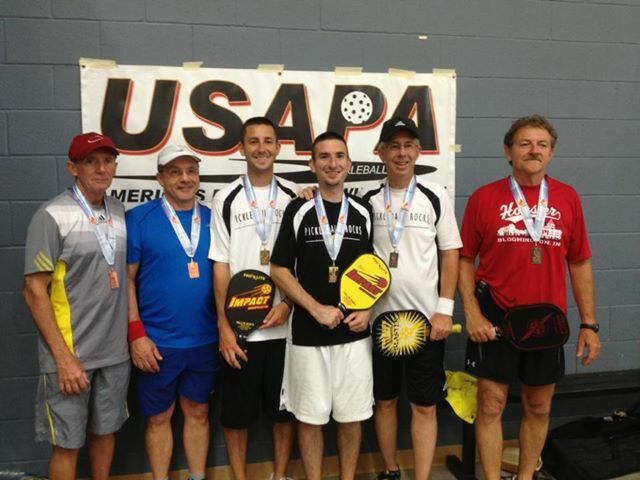 The pickleball fanatics are at it again. 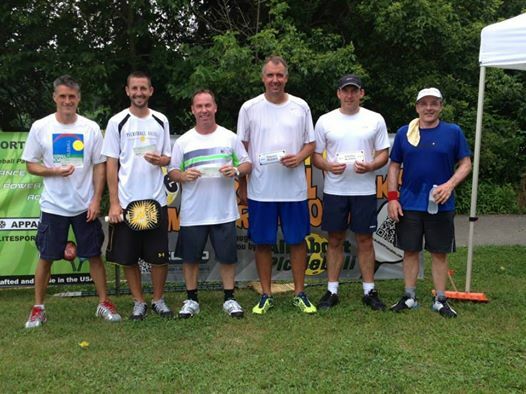 This summer for the first time ever, we are bringing sixteen high level players to tiny Brookville, Indiana for what will be a fun memorable weekend of pickleball. 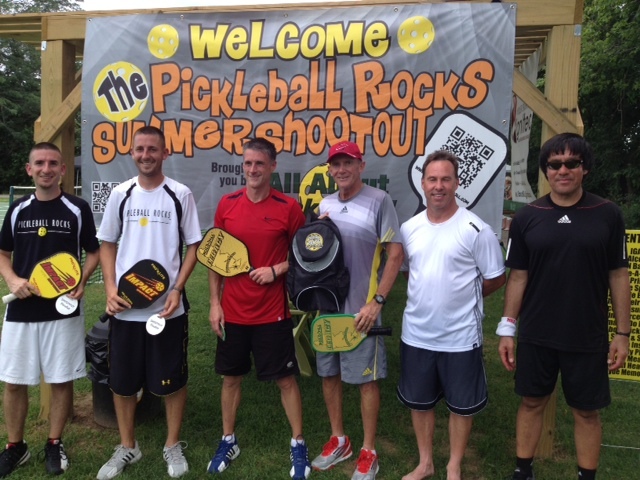 This summer we have decided to have a Men’s Pickleball Rocks 5.0 Doubles Summer Shootout in Brookville on June 28th and 29th. We were looking for 16 high level players to come to Brookville for a shootout like never before. No need to bring a partner, as this will be an every-man-for-himself doubles shootout. Well the shootout draw is NOW FULL. Over 2 days you will be playing a 15 match round robin, where you will play one 15 point game (win by 2) with each and every other player entered. YES, you will have a new doubles partner for each of your 15 matches. 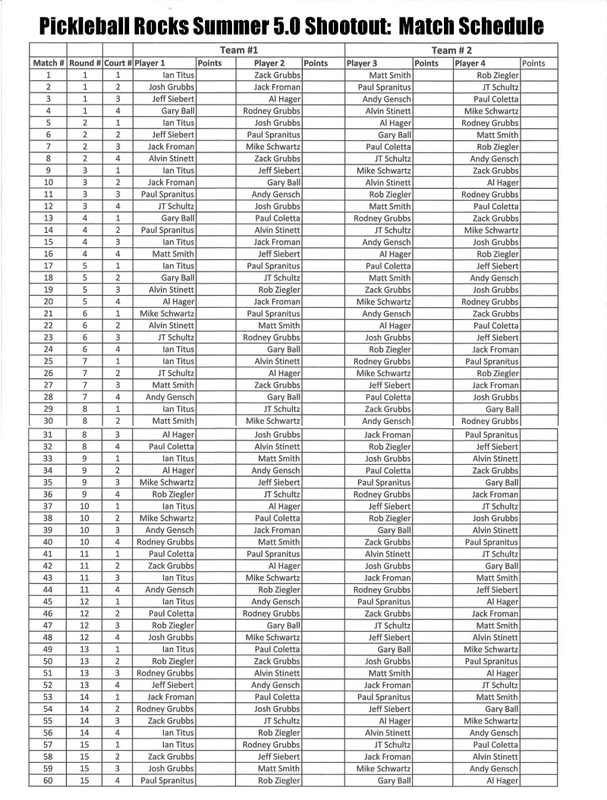 Individual points will be tallied after each match with 20 points awarded to the match winners and the losers receiving their actual points scored during the match (maximum 13). The tournament winner will be the individual with the most total points at the end of your 15 matches. Tiebreaker will be most match wins, then Head-To-Head. Day 1: Play will begin at 10:00am on Saturday June 28th with 8 matches scheduled. There will be a break for lunch with a bag lunch provided. After play has concluded, a cookout will be provided at the Grubbs home in Brookville. Day 2: On Sunday June 29th, play will begin again at 10:00am with 7 matches scheduled. Sunday lunch will be provided with play concluding around 4pm. Winner Receives $150 CASH, Second Place Receives $100 CASH, Third Place Receives $75 CASH, Fourth Place Receives $25 in Pickleball Rocks Bucks (good for Pickleball Shopping), Fifth and Sixth Place Receives $10 in Pickleball Rocks Bucks for pickleball shopping. Should be a weekend to remember. I know I’m looking forward to it. Jim Hackenburg (injured and rehabbing) we’ll miss Jim. Hurry back! First Place $150 Paul Sprainitis (279 pts). 2nd Place $100 Josh Grubbs (275 pts). 3rd Place $75 JT Schulz (241 pts). 4th Place $25 Matt Smith (232 pts). 5th Place $10 Andy Gensch (230 pts). 6th Place $10 Paul Coletta (228 pts).